Previous PostCIVA Sun directionNext PostNew Shapemodel! BTW, don’t know why but I can’t post into this forum. Mattias: Beautiful work. The fog effect makes it look more like an atmosphere, would the emissions have such a pronounced effect? 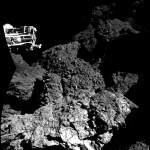 From the CIVA panorama it seemed as if the lander was trapped inside a confined space, but from your distance cues it does not look like that is the case, so finding Philae should not be that difficult. Also, any chances that the other side of the panorama, where also some cliff-like features are seen, can yield some depth cues? The fog effect is just added to visualize the guesstimated distance. It has nothing to do with expected emissions around the comet. I think it really helps me when I try to understand the landscape. Airless worlds are confusing. The Apollo astronauts reported problems in judging distance on several occasions. And they still had the benefits of both stereo vision and mobility. Thank you for that link doeika. Will read. Hi Matthias. I posted a comment before, it seems not to be here. To say again just a brilliant picture, just love the mist effect it really helps. After I saw this image, like Kamal I figured it should be possible to find this view within the CONSERT defined search area. Sure enough I found one. Since that point I have used my limited skills and software to try and explain my reasoning using a series of images, (click on the left arrowin my photo stream). In the process I think I have found Philae, but I am restricted in how I might prove it. Since finding her was directly due to your wonderful image I only take a bit of credit, most of it should go to you. 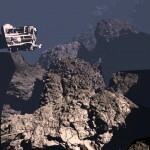 This little finger of land has only recently been revealed by the changing season on 67P so I am not sure if it appears on your shape model, but I was wondering what you might be able to do with your array of toys. Once again thank you for sharing this fantastic image.